I pretty much hated Christmas cake growing up, which many years ago consisted of fruit cake covered with marzipan and hard fondant. Maybe hate is too strong a work but just sayin.........I'm not a fan of fruit cake. So I decided to create an Anti-fruit cake this year and in doing so I think I've made a cake that is so much more Christmassy than fruit cake could ever be. 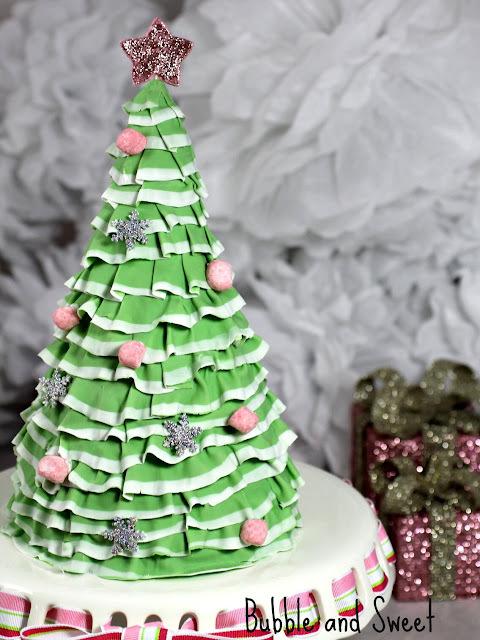 Yup this is an actual Christmas Tree cake made from white chocolate mud cake, layered with white chocolate ganache, covered with rolled fondant and decorated with strawberry bon bons and glittery fondant decorations. 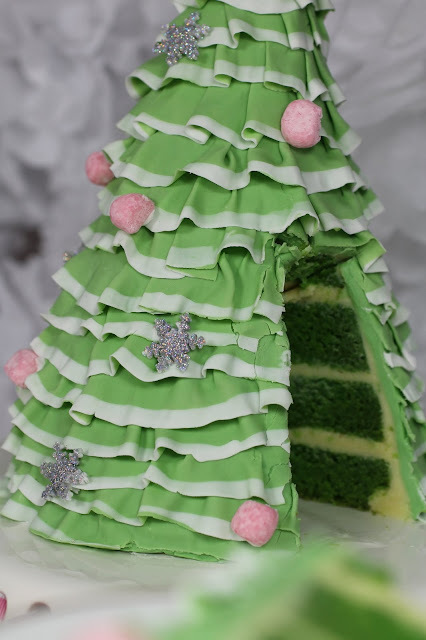 Which I guess is nothing special, because you know, people have made Christmas Tree Cakes before. 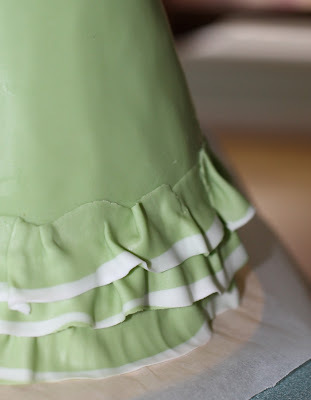 But this one is covered with layers of pretty fondant ruffles- which looks pretty cool. Someone less determined may have given up on this cake halfway through, perhaps when their daughter told them it looked like a lovely dress. When I mentioned it was going to be a tree she replied, It's OK mummy, don't worry your just not so good at Christmas Trees, your great at other stuff, you just need more practice (Now I totally know how annoying that must sound when I say stuff like that). 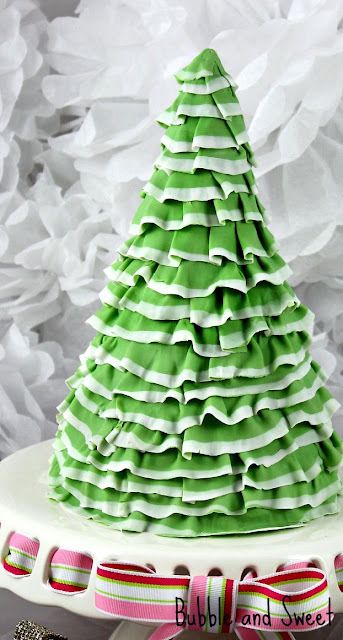 However when all the ruffles were attached she conceded it did in fact look like a tree and I had done an OK job. The recipe I used for the inside of the cake was the white chocolate mud cake from the Planet Cake: A Beginner's Guide to Decorating Incredible Cakes cookbook. 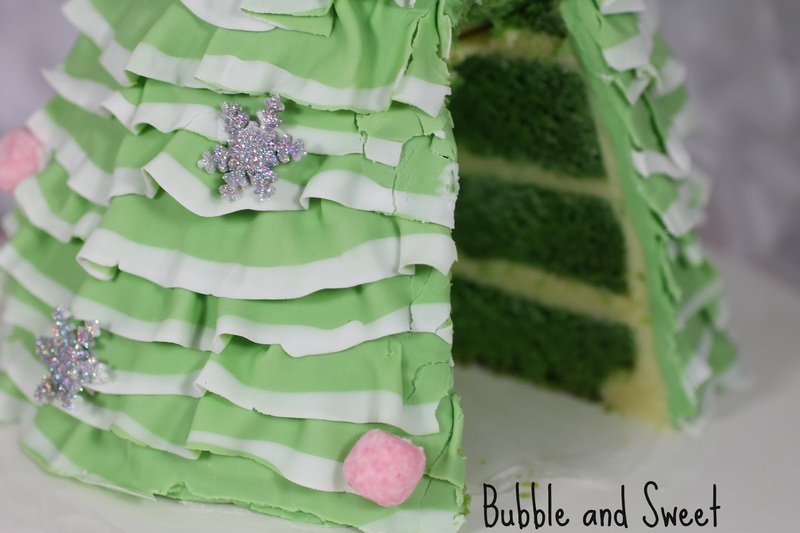 Sorry everyone I can't share the inside of the cake recipe - apart from a couple of early posts before I knew any better I don't post other people's recipes here on my blog - it's all original Bubble and Sweet stuff. 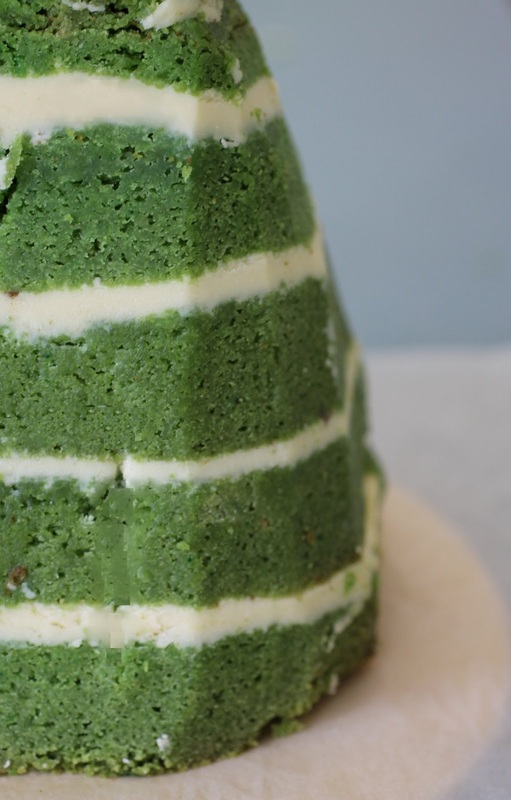 I'm sure if you google white chocolate mud cake you could find a lovely recipe, or maybe a nice peppermint or even lime version. 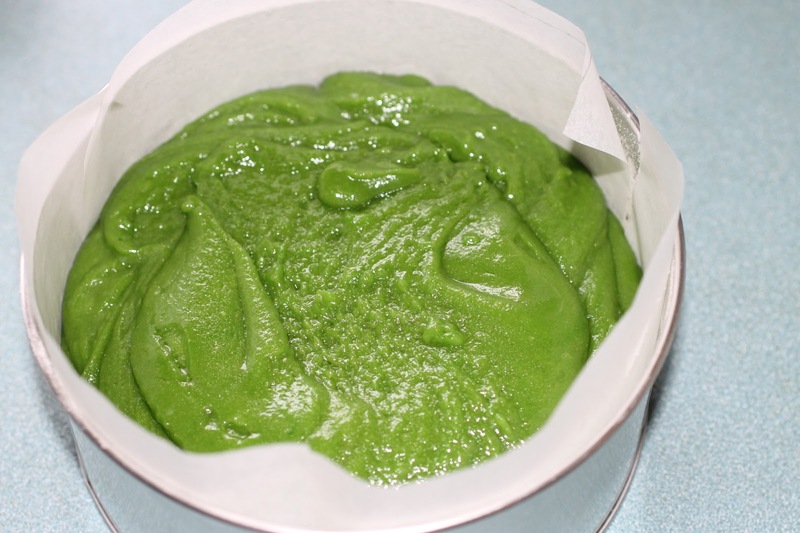 I colored the cake green using Wilton moss green and Wilton leaf green, halved the batch and baked 2 X 16 cm round tins, and then made up another batch and did the same. 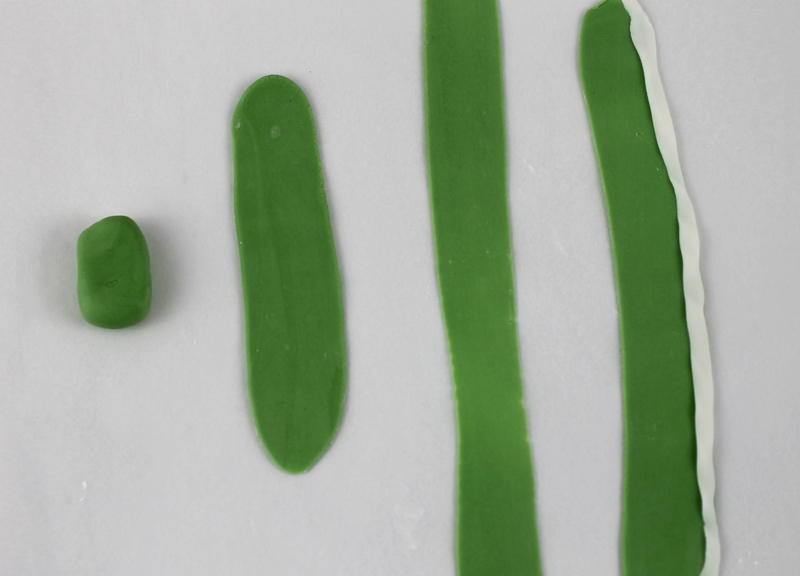 In all I ended up with 4 X 16cm green mud cakes. I used white chocolate ganache to fill in between the layers (in all about 850g white chocolate mixed with 1/3 ratio of cream). And as an update to my previous post, I have confirmation from quite a few of the stores that my book is in fact being shipped right now so I say the US Release is official. If you like the things I create here on the blog my new book Sweets on A Stick is out now and available to purchase here at Amazon. 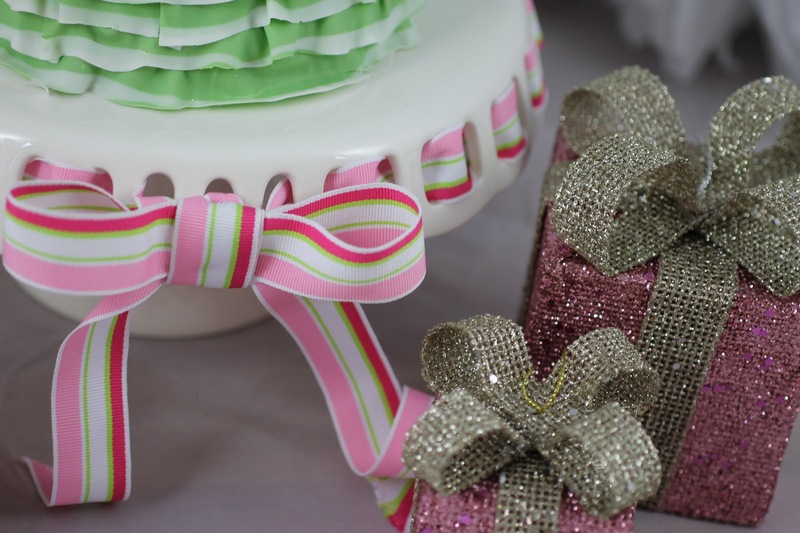 If you don't have non toxic food glitter to make the decorations just use candy, or plain fondant, or maybe some premade sugar decorations, you know just what ever you like or have handy. Using a small amount of ganache adhere one of the cakes to the cake board, spread a generous amount of ganache evenly on the top of the cake and then place a second cake on top of the first cake layer. Place into the fridge to set. Once set remove from the fridge and spread on an even layer of ganache on top of the second layer. Place the 3rd cake on top and pop the cake into the fridge for the ganache to set. Remove from fridge spread an even layer of ganache onto the third cake layer and pop the 4th layer on the top, quickly pop a skewer or dowel in the center of the cake pushing it thru all 4 layers and return the cake to the fridge to set. Does that carved shape make my layers look really uneven? Using an offset spatula spread the remaining ganache on the sides of the cake cone, making the sides as smooth as possible. I popped the cake into the fridge for the ganache to set and then smoothed on a final layer. Tip - although with most cakes you need a really super smooth finish on the ganache you can get away with a little roughness on this one as all of it will be covered with ruffles. 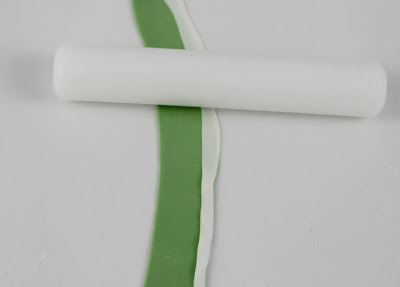 Dust the workbench with cornflour (cornstarch) and using the large rolling pin roll out the green fondant large enough to cover your fondant cone. 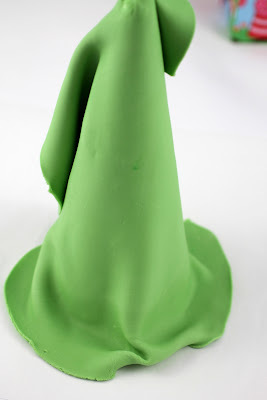 I shaped my fondant into a rectangle which was tall enough in width to cover the cone from the bottom to the tip of the cone and wide enough to wrap around the base of the cone. Pick the fondant up and wrap it around the cake cone (I'm using a fake styro one for these pictures), smooth the fondant down along the whole edge opposite where the seam will meet (that would be the middle of your large piece of fondant). Work quickly and carefully. The fondant will rip and tear if you are not careful. Once again the fact that you are covering the whole cake with ruffles will work in your favor here. 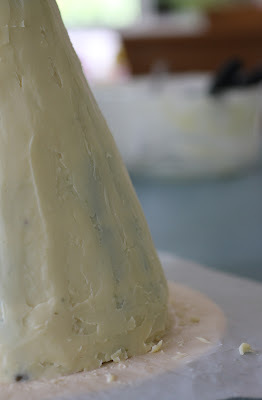 If the fondant does happen to tear, pull it back together and press it in until it kinda holds. 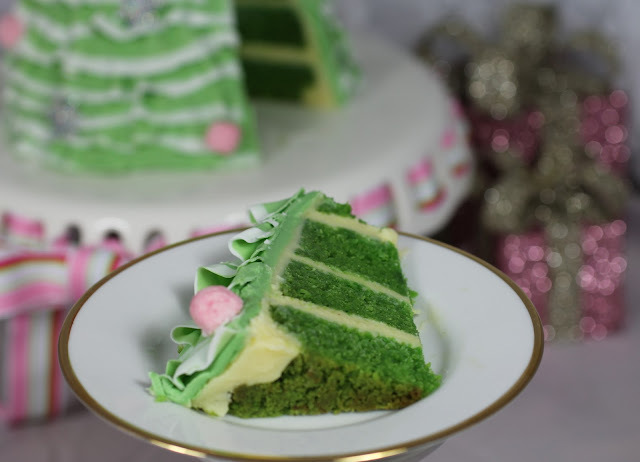 Anyway, keep working the fondant onto your cake until you get to the seam at the back, wrap one layer over the top of the other and using a sharp knife cut a straight seam down the back through both layers. You can then easily remove the top layer of overhang from one side. Then pull back the fondant to get to the underlayer of overhang and remove that. Push the seams together, once again do your best but it will be covered. Neatly trim any fondant overhand from the bottom of the cake using the sharp knife. 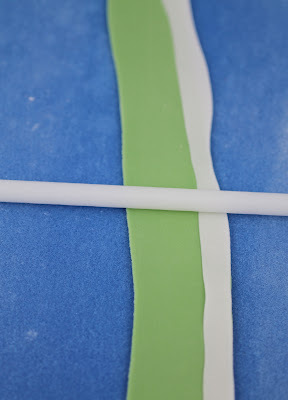 (Optional for thinner ruffles) Pick the strip of green/white fondant up and place it onto the non stick foam. Using the middle section of the frilling tool roll back and forth (like using a rolling pin) to make the strip even thinner, you will probably get it to double in length. Then use the edge of the frilling tool rolling back and forth to frill the white edge of the strip a little more. 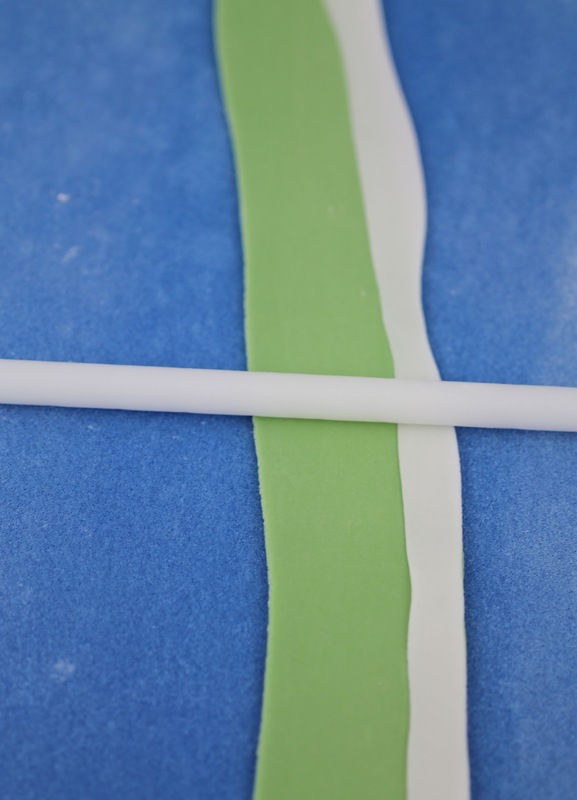 Attach this strip of fondant to your cake cone starting at the bottom. 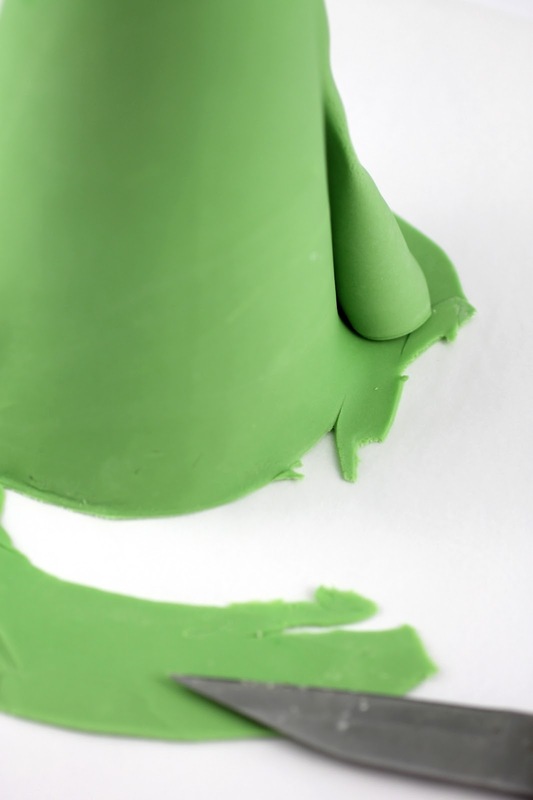 Brush on a very small amount of water to the cake cone and press the fondant strip onto the cake. I tried to gather the strip to make it appear more ruffly (see picture). Continue making strips of fondant and attaching them to the cake cone working your way up until the whole cone is covered, starting a new strip at the same spot you finish off the last strip. Using a toothpick push a small hole into the top of the cake (this is where the star will sit). I allowed the fondant ruffles to set a little while I made the decorations. Roll out the pink fondant and cut out a star shape (for the top of the cake) and lay on a tray covered with parchment paper. Carefully insert a toothpick into the side of the star, so when the star is laying flat on the tray the toothpick would be parallel with the tray. 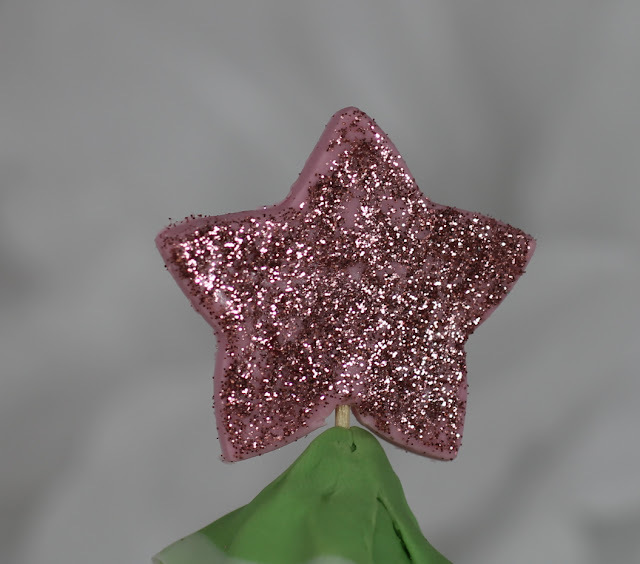 Brush the star with a small amount of water and sprinkle the non toxic pink glitter over the top of the star. Allow to set and remove excess glitter. Roll out some white fondant and using a snowflake cutter press out about 20 small snowflakes, lay on some parchment paper, brush each snowflake with a small amount of water and sprinkle on the non toxic silver glitter over the top of the snowflakes. Allow to set and remove excess glitter. 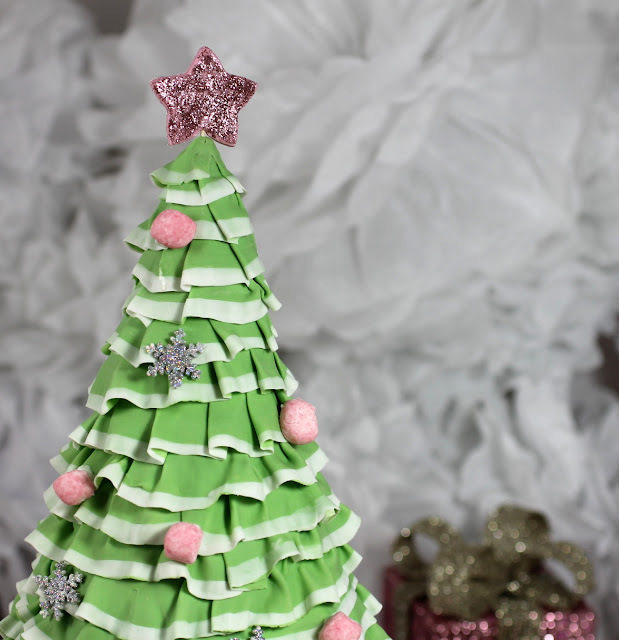 Once all the decorations are set you can insert the star into the top of the cake by gently pressing the toothpick into the hole you made earlier at the top of the ruffle Christmas Cake. Carefully cut the bon bons in half using a sharp knife and adhere them and the silver snowflake decorations using the royal icing as desired. That is just stunning! I love your Christmas cake. I never liked Christmas (fruit) cake when I was young, in fact I disliked it so much I refused to have fruit cake for my wedding. Funnily enough, I do like it now. I love your christmas cake. :)))))))))))) Brilliant idea! Thankyou so much for sharing, Linda, this cake is fabulous! I've been looking forward to seeing more of this cake. It is so awesome! I'm not a fruitcake fan either, I'd love one of these on my Christmas table. Wow! Incredible - going to try this for Christmas - wish me luck! Thank you for all the step by step photos. So appreciate that. Such talent too! Is absolutely beautiful, love it!!! Thanks for you step by step! Et en français c'est pas possible ? It's a beautiful Christmas tree! Love it. This is the cutest christmas cake ever!! congratulations, and thank you for the "how to"
That's gorgeous Linda! 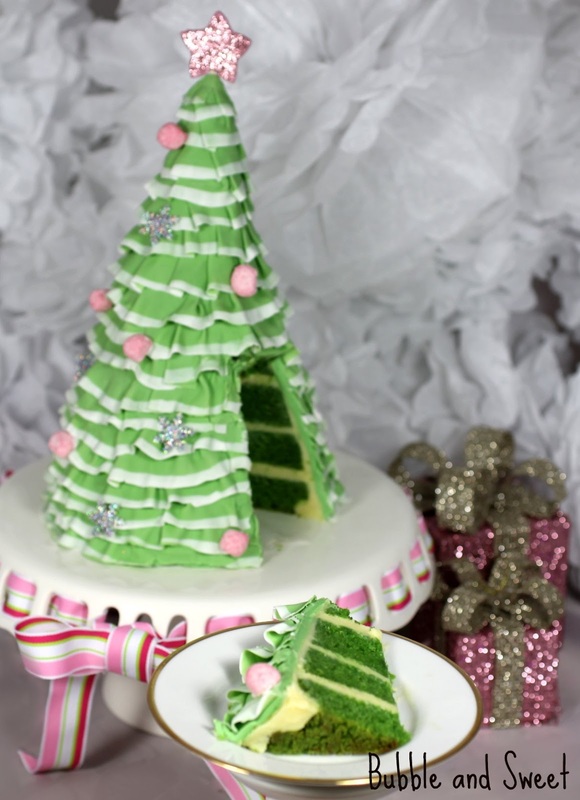 And I can really imagine it would work so well for those Dolly Varden cakes for a pretty skirt too! Wow that cake looks amazing a VERY tasty too! I am definitely going to be looking up the recipe for white chocolate mud cake!!! Thanks for sharing your beautiful creation! this looks just beautiful. I am new to your blog. one of my friends` recommended me to check your blog. and loved it! Very nice! Congratulations on this beauty! 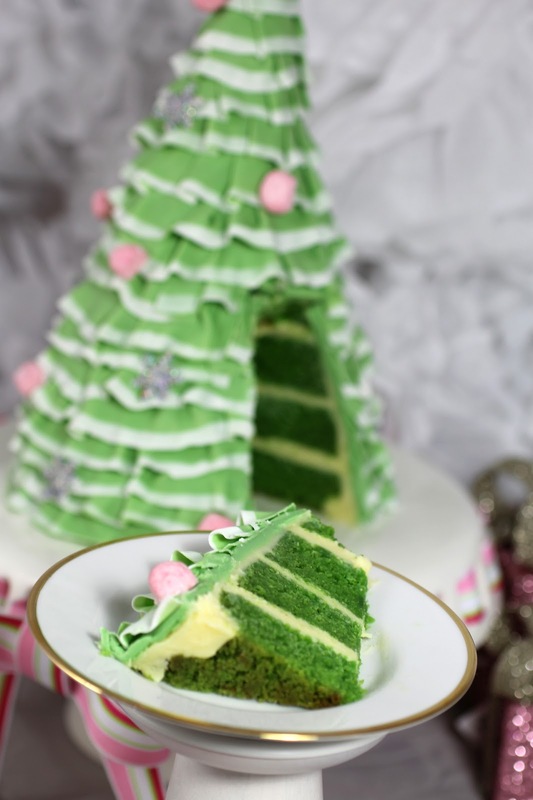 This cake is so unique and GORGEOUS, Linda! The ruffles are just unreal! PHENOMENAL! I knew I've seen this post before! When I thought of a New Year's cake, this image popped into my mind. I'm happy I managed to find it again! Making it definitely! Wow! This is so incredible! I am sitting here with my daughter telling her that we need to try this masterpiece! Absolutely gorgeous! ps I hate fruitcate too! love it...this is on my list for next year for sure!!!!!! I have found my new fave blog i have featured you on my facebook page https://www.facebook.com/#!/VintageSpice Love your work i will be trying some of these great techniques out thanks heaps!! Love this cake. I am not a big fan of fondant so might try making it by ruffling butter cream. Thank you for such a beautiful cake. Beautiful and creative - thanks for sharing!